Stadio dei Marmi will crown the 2018 victor of the Longines Global Champion Tour of Rome this afternoon! Jousting for the LGCT championship, Ben Maher (GBR), Harrie Smolders (NED) and Alberto Zorzi (ITA), the top three riders must convert horse power into points. If Ben Maher (GBR) produces a winning performance today he could seal the championship, however, if Harrie and/or Alberto find themselves on the podium ahead of Ben the world must wait a tantalizing nine weeks for the LGCT of Doha to distinguish the overall 2018 LGCT Champion. The LGCT of Rome presents the world’s best show jumping over four days. Day three promises to be a fiery affair as spectators will witness gladiatorial action in the lead up to final. All appetites can be satiated by the village offerings of gelati, luxury brands and ice-cold beverages. After the championship event, the equestrian entertainment continues at 19.00 hrs when the arena will be enchanted by the Carosello Villa Buon Respiro Show, Carosello Lancieri di Montebello Show and the I Cavali a Roma - Il Carnevale Romano Show. What’s more? 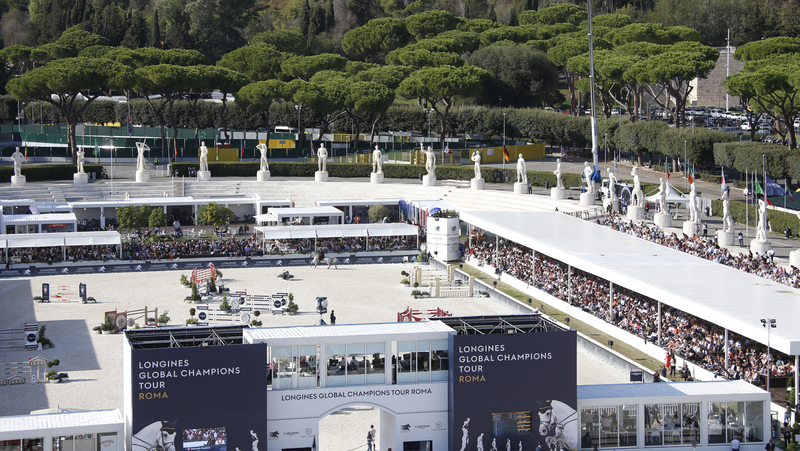 Spectatorship is free at the LGCT of Rome! The action kicks off at 12.45hrs for the GCL and at 16.30hrs for the LGCT Grand Prix of Rome local time and if you can’t be here in person you can catch it all live on GC TV and via FB LIVE on the official page.